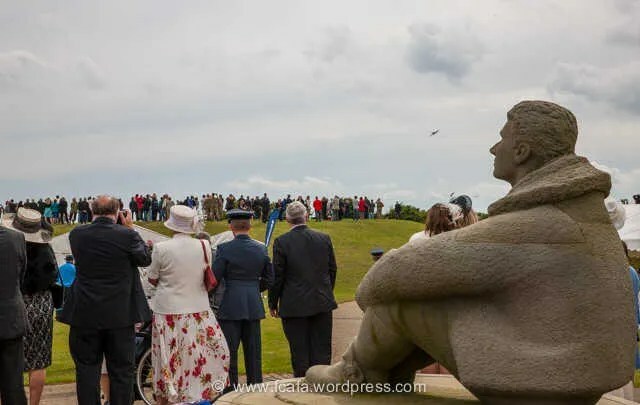 The 74th Anniversary to commemorate the Battle of Britain was held on 6 July 2014 at the National Battle of Britain Memorial, at Capel-le-Ferne, Kent. After several years of having good weather for this event, 2014 was to be a change with wet weather making its mark. The rainy start caused minor changes to the normal schedule of events event and a slight delay to the start of the ceremony. 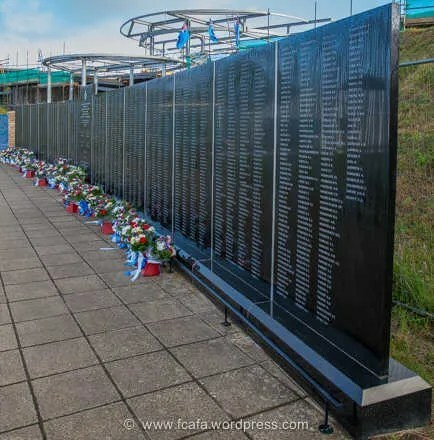 For this years event eight Battle of Britain pilots ‘The Few’ were able to attend. Sir Michael Graydon GCB CBE; President Battle Of Britain Memorial Trust, Air Chief Marshal Sir Peter Squire GCB DFC AFC DL, relatives of some Battle of Britain pilots, local dignitaries, invited guests , Richard Kornicki of the Polish Airmen’s Association, Air Training Corp squadrons from around Kent and South-East London, veteran servicemen and women and despite the inclement weather a large number of spectators. The ceremony was opened as usual at 1:30 with a flypast of a Spitfire and Hurricane from the Battle of Britain Memorial Flight, who extended their entrance display to accommodate the later start of the ceremony. 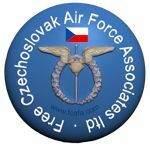 The ceremony commenced at 14:00 with the entrance of the RAF and Polish standards with escorts who took their position by the guests marque. They were followed by a parade of some 60 Standard bearers from ex-Service Associations and also Air Training Corp squadrons. The Central Band of the RAF playing under cover of the marque with speeches, o made in the marque which was projected to outside large screens. 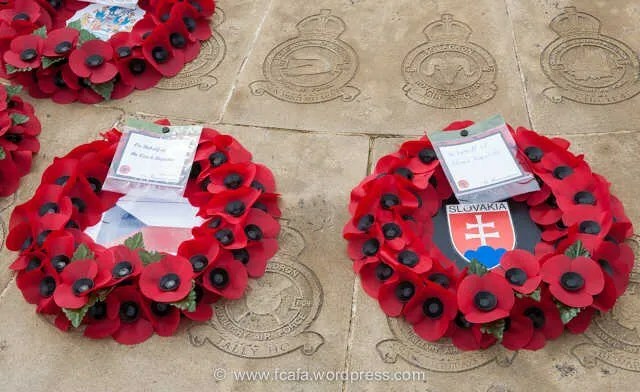 Wreaths were then layed at the Memorial by The Viscount De L’Isle MBE, His Excellency Witold Sobków, Air Chief Marshal Sir Michael Graydon, local dignitaries, representatives of various RAF Associations, local councils, Capel-le-Ferne primary school and Military Attache’s representing Australia, Canada, Czech Republic, France, New Zealand, Slovak Republic and the United States. Col. Roman Siwek and Col. Milan Gavlas. 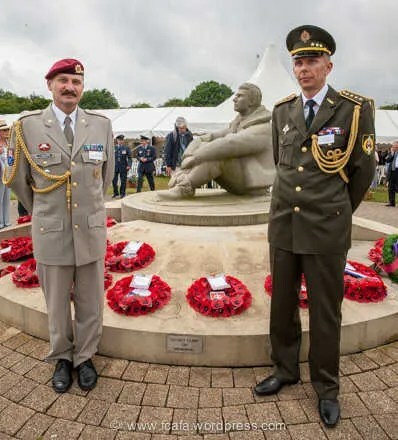 Amongst the numerous wreaths laid at the ceremony were wreaths laid by by Col. Roman Siwek, Defence Attaché of the Embassy of the Czech Republic, London and by Col. Milan Gavlas, the new Defence Attaché at the Embassy of the Slovak Republic, London. 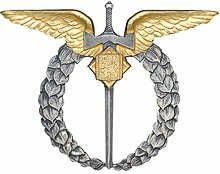 This entry was posted in 310 Sqd, 312 Sqd, Battle of Britain, Ceremony, Events, Memorial. Bookmark the permalink.